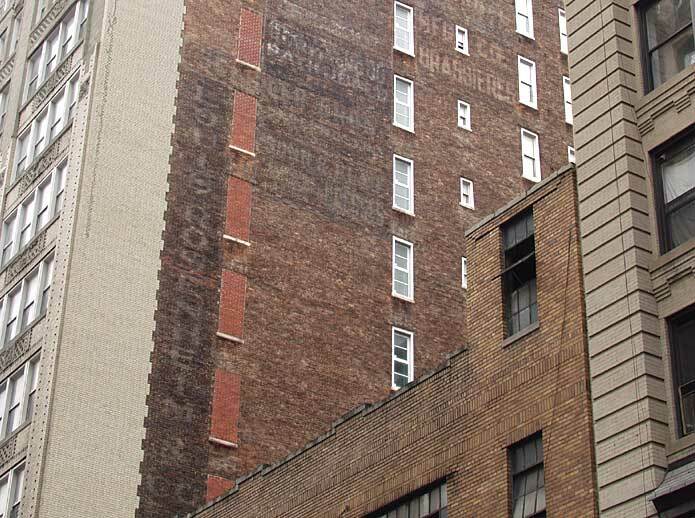 Louis Rosenheim & Co.'s dim but visible sign descends horizontally towards the front of this side wall on 24th St. The story of the Rosenheims in New York goes back to the 1840s when the brothers Leopold Rosenheim, Maier Rosenheim and Seligman Rosenheim held forth as "Rosenheim Brothers, Fancy Goods" at 355½ Grand St. downtown on the East Side on the corner at Essex Street. (The term fancy goods is defined in Webster's Revised Unabridged Dictionary of 1913 as "fabrics of various colors, patterns, etc., as ribbons, silks, laces, etc., in distinction from those of a simple of plain color or make.") They were dealing, then, in the fabrics and materials that the homemakers of the 1840s used to make their Sunday-best clothes. These original Rosenheims were immigrants from Bavaria, as was Louis Rosenheim's father, Seligman L. Rosenheim (1830-19??). It is not clear what his relationship was to Leopold, Maier and Seligman, but probably not a brother, more likely a cousin, although definitely related since they shared housing for at least the first 10 years Seligman L. was in the country. Seligman L. appears in the U S Census of 1870 at age 38 living with his wife Emilie and son Louis age 3. He immigrated in 1856 and became a naturalized citizen in 1866. He opened his own fancygoods business at 108 the Bowery in 1856 and soon after entered into a partnership with Lieberman Libman (1834/35-?) at this address. Rosenheim & Libman stayed in business from approx. 1858 until the end of the 1870s. The nature of the business is variously described dry goods, fancy goods, lace, notions, hosiery and white goods. Probably much of the merchandise was imported. Around 1880 this business converted to manufacturing as E. Rosenheim & Co. The "E" was Emily Rosenheim, Seligman L.'s wife and Louis' mother. Presumably Seligman L. Rosenheim shared management of the company with his wife. They were located on Walker St. near Church St. about 2 blocks south of Canal St. E. Rosenheim & Co. manufactured clothing with a specialty in infants' wear. Louis Rosenheim (1866-?) is first listed as part of the company in 1889, and the business name changed to E. Rosenheim's, Son at that time. Around 1897 E. Rosenheim's Son moved to Houston St., then in 1899 to Wooster St. By 1903 Louis Rosenheim seems to be running the company without the participation of his parents. By 1908 he acquired a partner, Edward Frederick Brandeis (1873-?) (Brandeis seems to have served as salesman at this early stage), and the company moved again, this time to 114 W. 17th St. (This ad for E. Rosenheim's Son appeared in Fairchild's Women's Wear Directory, July 1911.) Around 1912 Sol Dreyfuss (1868?-) joined as a third partner. The company name changed to Louis Rosenheim & Co. in 1913, and the move to 119 W. 24th St. came in 1918. This ad for Louis Rosenheim appeared July, 1919. The specialty in infants' and children's clothing continued throughout these years. The company left their 24th St. location in 1926, and closed for business only a few years later. Louis Rosenheim appears in the U S Census of 1930, age 63, listing occupation as "none." He lived for nearly 30 years (from the late 1920s until the mid 1950s) at 210 W. 70th St. This ad for Louis Rosenheim & Co. (formerly E. Rosenheim's Son) at 114 W. 17th St. appeared in The American Cloak & Suit Review, Dec. 1913. Alberts Mfg. Co., Brassieres (click for image). Jacob Leo Alberts (1876-1955, immigrated from Russia 1890) was a furrier on E. 8th St. from around 1904, then in 1910 began a collaboration with his sister Rose Alberts (later Rose Epstein) manufacturing "covers" (bed covers?) on Mercer St. and Waverly Place. This was the original Alberts Mfg. Co. In 1915 they switched to brassieres and moved uptown to W. 26th St. The move to the building above, 119 W. 24th St., came in 1918. Alberts also manufactured brassieres under the name Cinderella Brassiere Co. In the US Census of 1920 Jacob L. Alberts was living in Yonkers with his wife Bella, 3 sons, Sidney, Gerald and Louis, and his brother Leon N. Alberts (1887-1970, born Russia, immigrated 1890). Alberts Mfg. Co. stayed at 119 W. 24th St. until 1930, then closed for business 2 or 3 years later. The Cinderella Brassiere Co. continued until around 1940, but Jacob L. Alberts seems to have retired some 10 years earlier. In the early 1930s officers for Cinderella Brassiere were Jacob Kaneil and Leon N. Alberts (Jacob L.'s brother). Schiller Bros. (click for image). This is a very faint horizontal sign just above the Louis in Louis Rosenheim. The Schiller brothers were underwear manufacturers: Harry Schiller (1868-?) and Marks Schiller (1860-?). Harry was also called Henry Schiller and Marks was also called Max Schiller. They were immigrants from Russia in 1879 and were in business together to manufacture underwear from around 1901. Harry Schiller can be found in the U. S. Census of 1900 living at 1806 Lexington Ave. (near 112th St.) with his wife, Sarah, son Lawrence, age 2, his mother, Gertrude, and a brother, Michael. The business moved to 119 W. 24th St. in 1913 and stayed until 1925. By 1925 Marks Schiller had retired. He appears in the U. S. Census of 1920 living in Clarkstown, Rockland County, NY and giving his occupation as "Retired." Marks' place in the company was taken by Harry's son, Lawrence Schiller (1897-?). The business seems to have failed in 1931, but was resurrected by the mid-1930s. They stayed in business at 31 W. 28th St. for another 40 years (1934-1974). (31 E. 28th St. was home to Schloss Bros., Ribbon Manufacturers, approx. 1914 until the early 1930s. See Schloss Bros. at 31 E. 28th St.
Sonn & Blau / Dresses (click for image). This sign is beneath Schiller Bros. and to the right of Rosenheim. The firm Sonn & Blau (click for ad) was formed in 1919. The partners were Louis Sonn (1878-1973) and Irving M. Blau (1894-1971). Irving Blau's brother, Jerome Blau (1897-1947) was also a partner. Louis Sonn, age 22, can be found in the U. S. Census of 1900, living with his father, Abraham Sonn, at 15 E. 99th St., Manhattan. Both father and son were born in Germany and immigrated in 1887. Louis Sonn's petition for naturalization in 1900 states that he was born 21 Mar. 1878 and that he arrived in the U. S. through the port of New York 6 Aug. 1887. He registered for the World War I draft in 1918 when employed as a salesman at M. M. Smith & Co., dress manufacturers, 155 W. 30th St. The Blau brothers are listed in the 1900 census living with their father, Joseph Blau, a pawnbroker, at 132 W. 119th St. Irving at the time was six years old and Jerome three. Both were born in New York. Their father, too, was a native-born New Yorker. Both boys were still living with their father at the same address in 1910 and in 1920. In 1917 Irving Blau registered for the World War I draft, age 22, still living at 132 W. 119th St. and employed as a salesman at the U. S. Ink Co., 1562 Broadway. A year later Jerome Blau registered, age 21, employed at Henry Sonneborn, 321 6th Ave. (a clothing manufacturer with headquarters in Baltimore). In 1921 the New York Times (4 June 1921, p. 19) reported "Louis Sonn has purchased the interest of Irving M. and Jerome Blau in the corporation know as Sonn & Blau, makers of dresses." Then on 26 Nov. 1921, p. 25, the Times announced a bankruptcy sale: "In the matter of Sonn & Blau, Inc., Bankrupt. - Chas. Shongood, U. S. Auctioneer for the Southern District of New York in bankruptcy, sells Wednesday, December 7, 1921, by order of the Court, at 10:30 A. M., at 119 West 24th Street, Borough of Manhattan, assets of the above bankrupt, consisting of dresses, fixtures, etc." Succeeding Sonn & Blau, Louis Sonn formed Louis Sonn & Co., Dresses, and the Blaus formed Blau Bros. Silk Dresses (click for image). Louis Sonn & Co. stayed in business until around 1928. Blau Bros. seems to have been renamed San Toy Flapper Dresses in 1922 (click for image). San Toy stayed in business until around 1929, but in 1925 the Blaus were no longer listed as officers in the company.